In the life that my mom and dad had before I was born, there were all sorts of adventures that I was never a part of. One of the big things that I always heard about and never got to do were the river trips–white water rafting trips where they camped along the way and my dad cooked all these amazing meals in Dutch ovens with coals, the big ticket items being his cinnamon rolls and “omelets” (I barely want to make cinnamon rolls in my house with an oven and my KitchenAid, let alone whilst hard-core camping, but that’s a conversation for another day.) 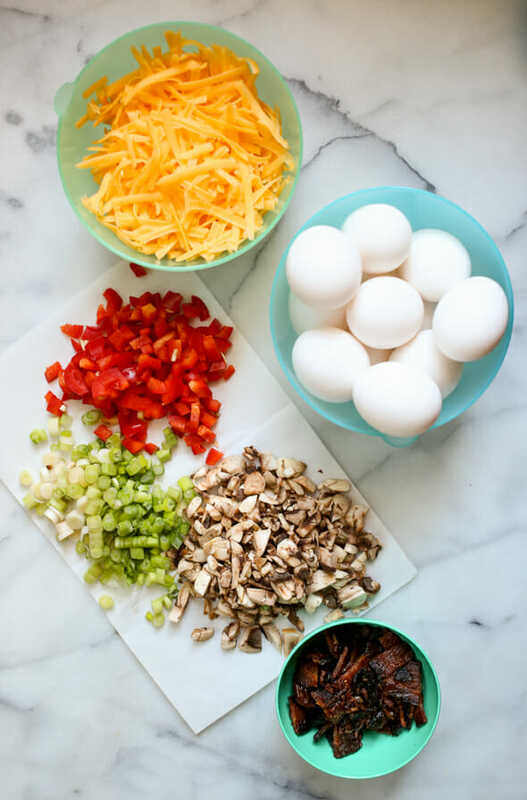 His River Omelets, as they were called, weren’t the kinds of omelets you’re thinking of (you know, a thin layer of scrambled egg folded on top of your favorite fillings, usually just made for you and only you), but more a frittata, perfect for feeding a crowd. Although I never got the whole river trip experience, we always had River Omelets for special occasions, a few times throughout the year, but always on Christmas morning (along with the cinnamon rolls.) Even though it was special occasion food growing up, this has become a regular staple in our dinner (and breakfast, but mostly dinner) rotation. It’s quick, it’s a good low-carb, high-protein meal, something everyone loves, and something I pretty much always have the ingredients for. I’ll sometimes make it in a large cast-iron skillet and cut it into wedges, but usually I’ll just bake these bacon, egg, and cheese cups as individual servings in muffin tins, which makes them perfect for popping the extras into the freezer and heating them up on busy weekday mornings when I’m usually eating a Kind Bar and drinking a Diet Coke and sweetly asking my kids to STOP TALKING ABOUT MINECRAFT AND GET THEIR SHOES ON. 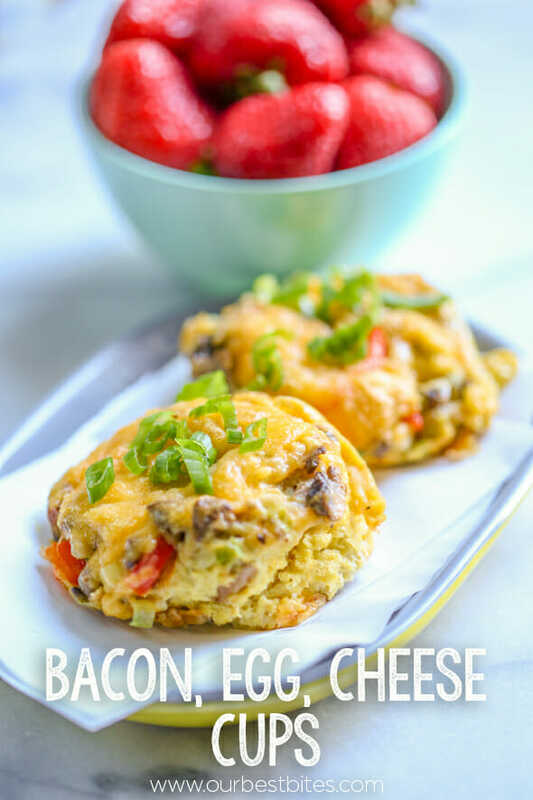 To make them, you’ll need 8 ounces of shredded cheese (I like sharp cheddar or pepperjack–anything on the milder side will get lost in the flavors and just be a waste of calories), 12 eggs, a small red bell pepper, some green onions, some mushrooms, and about 6 ounces of cooked and chopped or crumbled bacon. Evenly distribute the cheese over the veggies and bacon. 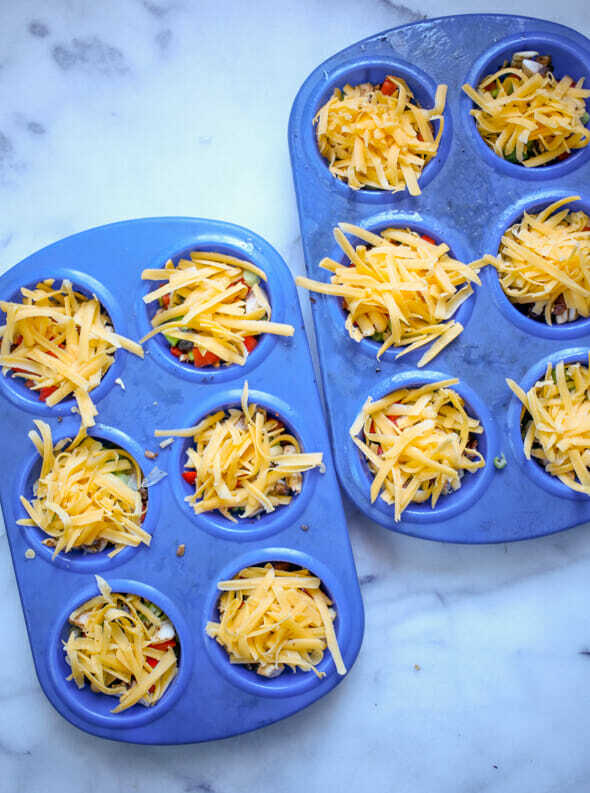 Pour the eggs over the cups to near the top of the muffin tin. To freeze for future use, allow to cool completely, then place in a large Ziploc bag and place in freezer. When ready to eat, place one muffin on a paper towel thaw for 45 seconds at 30% power and then heat for 30 seconds at full power. Make a dozen of these and freeze the extras for a protein-packed breakfast on busy weekday mornings! Preheat oven to 350. 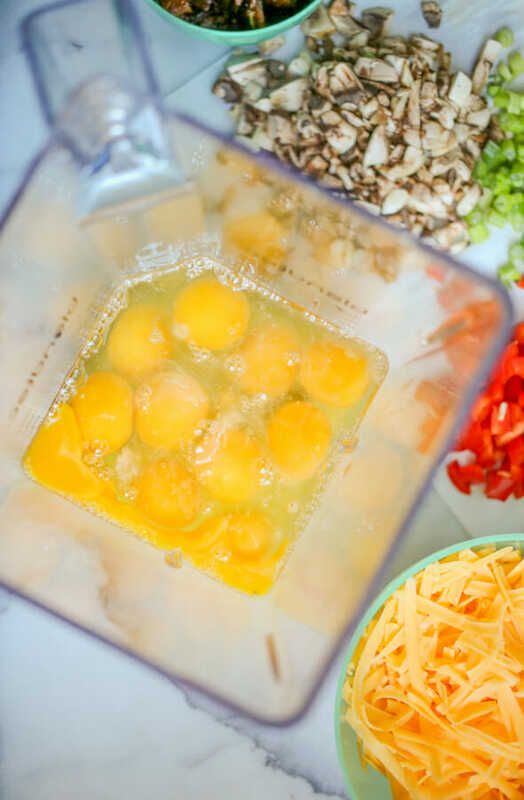 Whisk together the eggs, water, salt, and tabasco until the eggs are well blended (or pulse for a few seconds in a blender.) 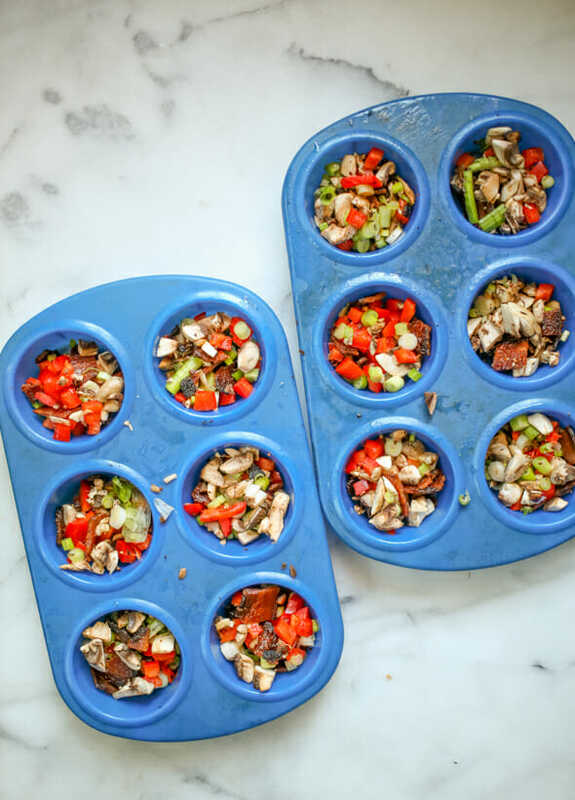 Grease or spray a 12-cup muffin tin with non-stick cooking spray and set aside. Toss together the mushrooms, bell pepper, green onions, and bacon. Distribute evenly among the greased muffin tins (it’s usually about a small handful in each cup.) Evenly distribute the cheese over the veggies and bacon. 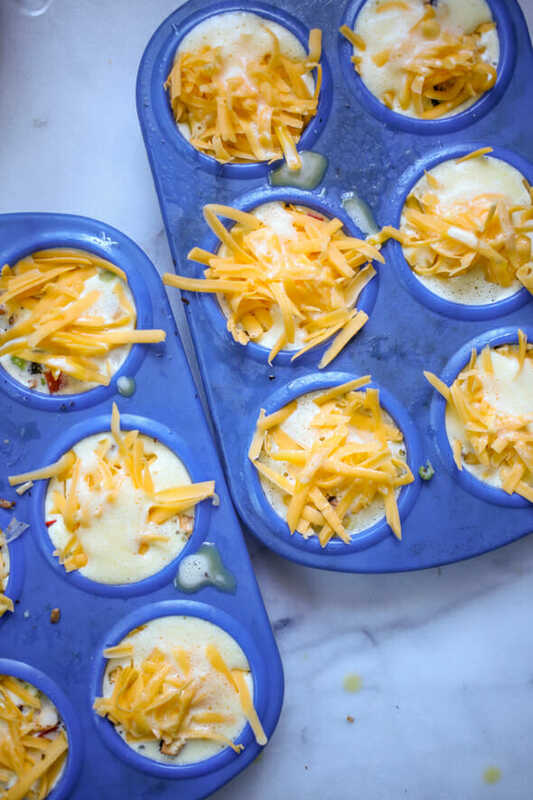 Pour the eggs over the cups to near the top of the muffin tin. Bake for 15-20 minutes or until cooked through. Genius. I love this idea. I’m in desperate need of a breakfast makeover for my whole family and this seems like a perfect place to start. Although a granola bar and a DC sounds right up my alley…. Haha! You have no idea how many times a day I have to ask my 4 yr old to stop talking about minecraft and put on his shoes… Or maybe you do! I love making a batch of these up, too, with whatever veggies and cheese I have that need to get eaten up. I do like to put feta in them moreso than a regular cheddar. Sometimes I do 1/2 just eggs whites and 1/2 full eggs to make it a little healthier, too. A great, fast breakfast. So glad to hear I’m not the only one drinking diet soda in the morning. Yes! These are perfect! Maybe if their mouths are full, my kids will stop talking about minecraft? Here’s hoping! Are those non stick muffin tins? If so, what kind are they…I have a lot of trouble with things sticking in my muffin tins. Do you have to spray them super well to get these out of the tins? I know I could go to the rectangular pan method, but these are really nice individual servings. Any advice? Mine are silicone, but they’re not exactly non-stick. Either way, lots and lots of non-stick spray is your friend…eggs are the worst! I’ve had a lot of trouble with two similar recipes (with and without shredded hashbrowns as a base) sticking and being a pain to pry out of the tins. I had tried different spray and greasing options on nonstick muffin tins as well as paper and foil muffin liners. All stuck. I gave up on the individual muffins and just make a casserole, cut large squares, and freeze individual squares. Not as cute but much quicker and functional. However, just yesterday my friend told me she had good luck using parchment paper muffin liners so i may try those for special occassions. I guess silicone is the only other thing i havent tried!! Parchment is a great solution!! I actually put a slice of bacon in the muffin tin (wrapped around like a cup), and then put your veggies and eggs and cheese in. Then it pops right out. No sticking and it holds everything together nicely. I still do a light spray of nonstick just in case. I made these tonight for dinner in non-stick muffin tins. I sprayed them well after reading all the comments and they came right out with no problem. And 8 out of 8 people in my family gave them a very enthusiastic thumbs up. I’ll definitely make them again! These look so fun and delicious! I’m definitely going to be trying these for a weeknight meal soon! I used to make something similar but I had kind of forgotten about it. I love how you can just use whatever veggies and meat you have around. I’ve done them with ham or sausage instead of bacon and they are great with any of them. Also, thanks for the tip on putting the chunky stuff in before the eggs. I used to try to mix them all together and it didn’t always go very well, which is probably why I stopped making them. This way will be much easier! This is a subject I feel very strongly about, hahaha! These look super yummy and super easy to make. I am going to be making these. Could this work if I used egg whites only? You *could* do egg whites only, but I’d maybe through a whole egg or two in for a little more body. I make these all the time… I prefer to sauté my veggies or roast them before putting them in the cups. I’ve also used both cooked and uncooked spinach. If using fresh spinach, I give it a rough chop. Anything goes in these babies. I currently teach Life Skills in a Special Education high school and my students are learning to make these. The staff love to buy them and request them all the time. I’ve done a BLT version with roasted grape tomatoes and spinach and of course, bacon. You could do a caprese version with grape tomatoes, fresh basil, and fresh mozzarella. I love that you can customize these to whatever you want. I made mines with my leftover salad and i sprinkle crackers over it.And now it is warming i cant wait to eat!